Large curved signs feature a curved face going from left to right with a flat back for mounting to the wall. Frames are made of aluminum in a satin silver anodized or black powder-coated finish with your choice of black or grey plastic end caps. 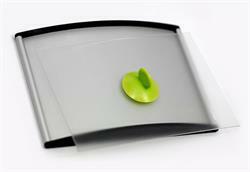 A matte clear, non-glare removable lens protects the insert and is easily removed with a suction cup. One suction cup is provided for orders of 1-5 signs and an additional suction cup is provided for every increment of 5 signs ordered. 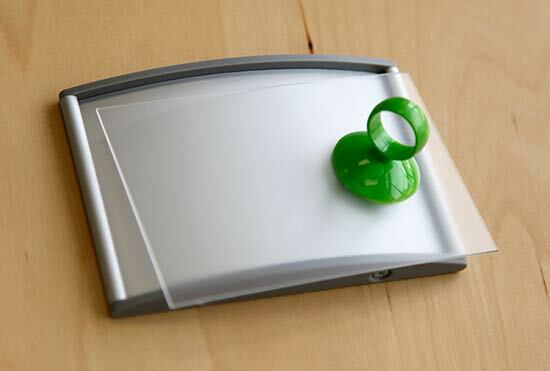 These signs are a great option for conference rooms, meeting rooms, directories, way-finding signage and more. Update the inserts and change them out as often as needed, quickly and efficiently without having to order a whole new sign. If you have any questions or don't see a size you require, contact our customer service team at service@officesigncompany.com or via phone at (701) 526-3835. Note: matte clear lenses come with a protective blue film that will need to be peeled off before use. Modular curved aluminum sign frames are a professional, economical solution for any space. Choose from a satin silver anodized or black powder coated frame finish and black or grey high impact plastic end caps. Signs come with a removable clear lens. 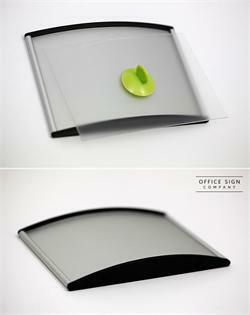 Popular curved-face sign system, with removable clear non-glare lens. 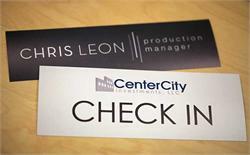 Sign frame accommodates paper inserts, engraved inserts and more. Clear lens can also be customized with ADA and braille. Easy on and and easy off lens makes changing your inserts easy. Aluminum curved signs in a satin silver anodized or black powder coated finish with black or grey plastic end caps have a removable clear lens for easy interchangeability. Create inserts for displays, directories, directional signage and more! Full color inserts printed specifically for our curved sign signs. Numerous sized insert available. Quantity discounts available. Send us your design or have us design it for you. 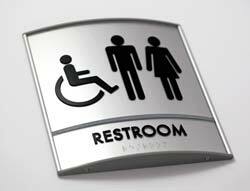 Durable, easily changeable sign inserts. Curved face building directory signs and lobby directional signs in various sizes. 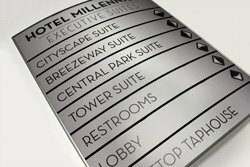 Custom inserts display tenants and wayfinding directions. Replaceable inserts under a protective clear, non-glare lens. Custom sizes. Order replacement lenses when needed.